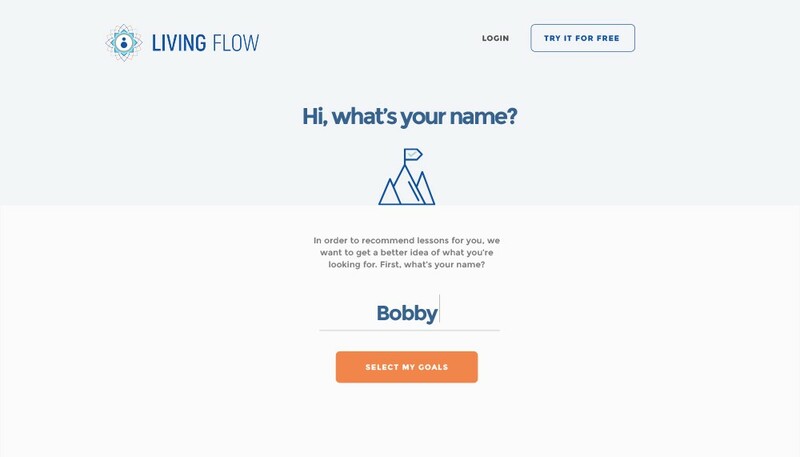 Living Flow wanted to create a new brand and digital service to reach new segments of the mindfulness and meditation market. Because the market is already fairly saturated, they wanted to create a new experience for people looking for more depth in their mindfulness practice. Crow and Raven designed and built a unique brand from the ground up. 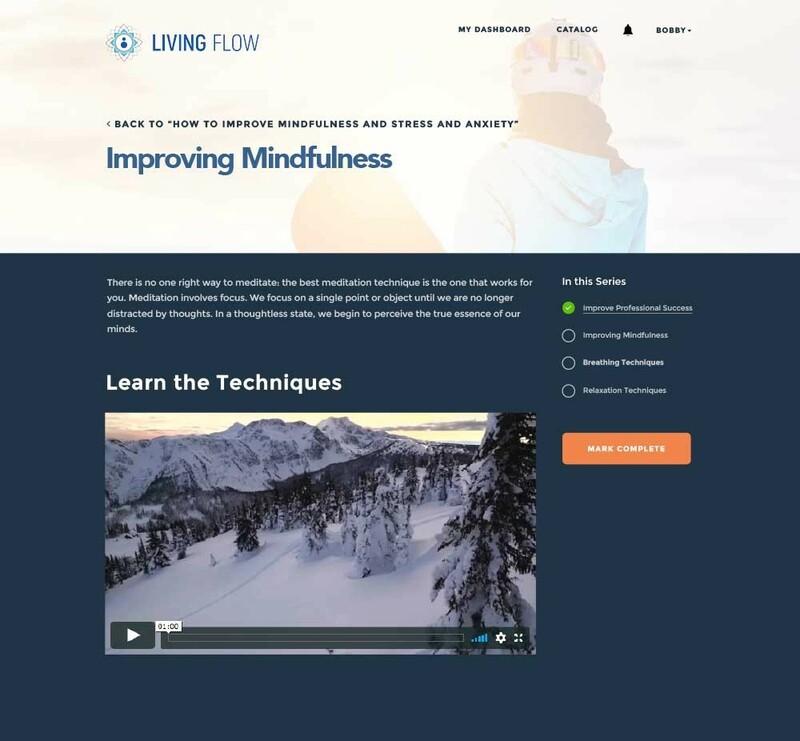 With a custom SaaS platform and marketing site, Living Flow can now provide meditation and mindfulness teachings to a diverse audience of emerging adults looking for accessible and engaging content to help them reach their goals. 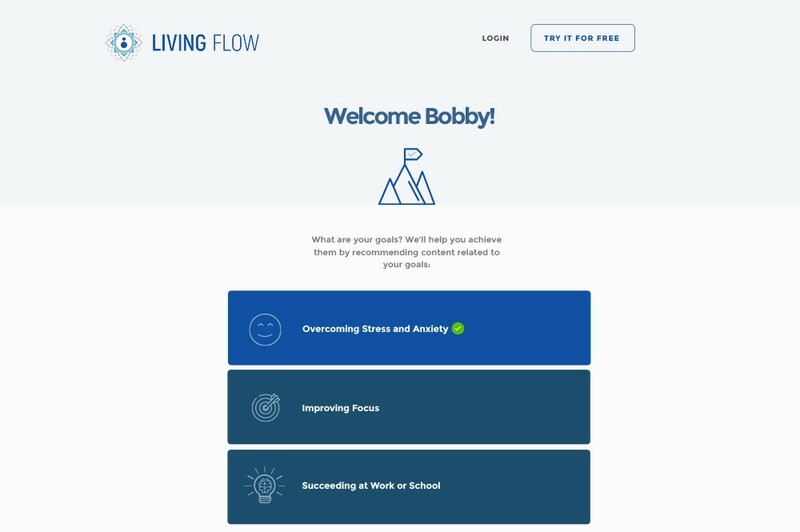 Living Flow is a modern digital platform that provides a diverse audience with self-improvement techniques, personal growth and transformation offerings, and instruction through online lessons. 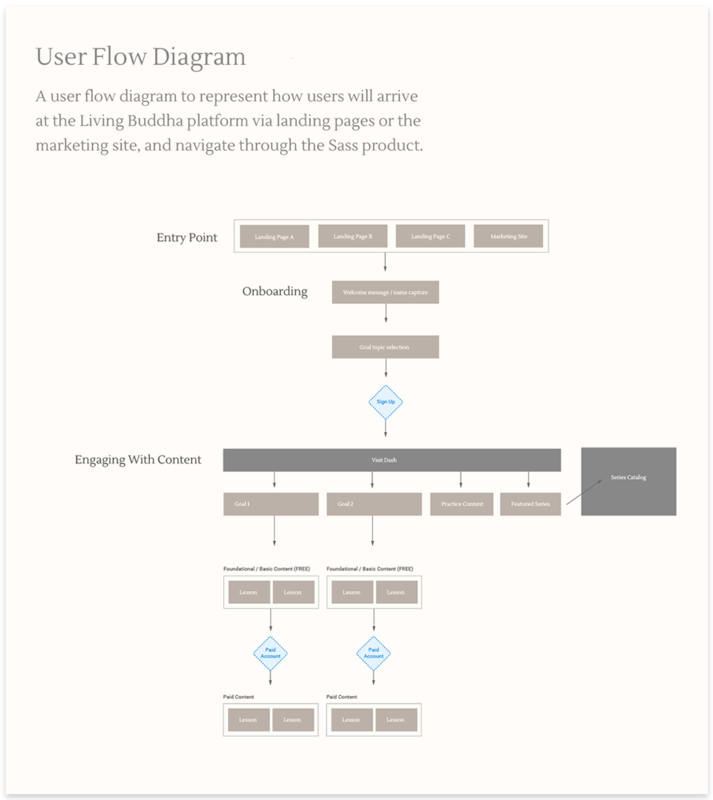 Living Flow integrates the ancient wisdom of Buddhism with the demands of modern life. Prior to engaging with Crow and Raven, the Living Flow team provided in-person teachings and resources to people for years. In order to amplify their organizational impact, they needed to create a digital platform with seamless user experience to scale their offerings. The digital space provides a unique commercial opportunity for making meditation and mindfulness practices more accessible to the masses. Analogously, increased happiness, better focus, and improved health and relationships are some of the core benefits of meditation. According to Forbes, several scientists have proposed that the health benefits of mindfulness are partially caused by attention regulation, body awareness, change in perspective on the self and emotion regulation. Because these factors are strong contributors to people's emotional and physical well-being, meditation may be the perfect apparatus for combatting the stresses of everyday life. The rise of stress and anxiety among Americans, along with an increase in the global wellness market, has influenced consumers to take control of their health, wellness, and personal and professional success. Growth within the global wellness market also provides a strong economic environment for digital mindfulness services to thrive. In 2016, the global wellness reached $3.7 trillion and is expected to accelerate by 17% in the next five years, according to a study conducted by Woman’s Marketing. However, with a growing trend of consumers valuing their health and wellness, organizations are often challenged on how to deliver innovative services that meet their unique and evolving needs. Therefore, defining Living Flow’s target customers and finding brand differentiators were key in our strategy to create a competitive advantage. How might we utilize design principals to distinguish the brand and make it more attractive to our target market? At the beginning of the project, the Living Flow's vision statement was to "provide personal growth and transformation offerings to a broad and diverse audience. We integrate the ancient wisdom of Buddhism with the demands of modern life." Building upon this vision statement, we conducted a Roadmapping Session to determine the business direction, key audience, and strategy for the MVP. 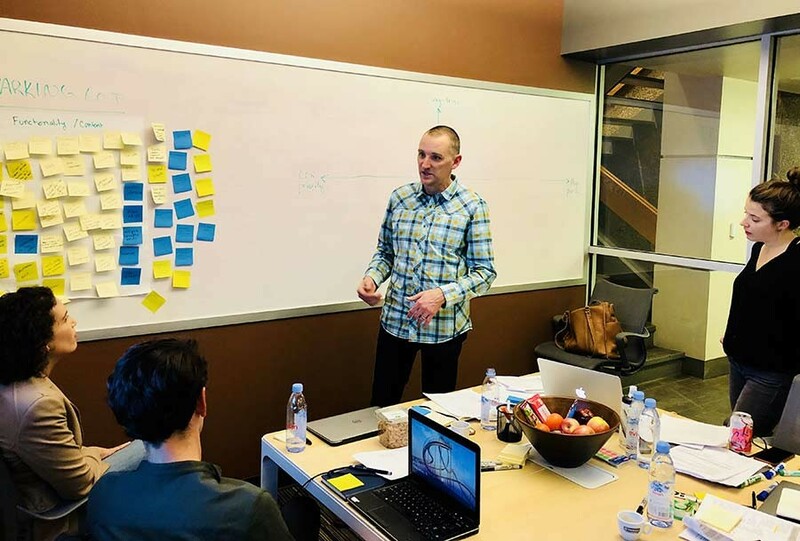 Roadmapping sessions are a fundamental aspect of our process for answering critical business questions through design, prototyping, as well as product development and strategy frameworks in a short amount of time. During the Roadmapping session, the audience focus was adapted as we honed in on opportunities for differentiating the brand. These discussions influenced various strategic directions in the design research phase. Young people are deciding who they are and what they want out of work, school and love. The post-high school years are marked by repeated residence changes, as young people either go to college or live with friends or a romantic partner. For most, frequent moves end as families and careers are established in the 30s. Freed of the parent-and-society-directed routine of school, young people try to decide what they want to do, where they want to go and who they want to be with--before those choices get limited by the constraints of marriage, children, and a career. Age of feeling in between. Many emerging adults say they are taking responsibility for themselves, but still do not completely feel like an adult. Optimism reigns. Most emerging adults believe they have good chances of living "better than their parents did," and even if their parents divorced, they believe they'll find a lifelong soulmate. Designing for the "emerging adult" became one of our primary design principals, so, accordingly, we built upon this principle by identifying other brands and services that effectively reached this market. By researching the competitive landscape, we were able to identify interaction patterns and user experience characteristics that would help us design a unique digital product experience. Design research is a foundational part of our process to design digital products, services, and systems that respond to human needs. We utilized various design-research methodologies to hone in on the user experience strategy that would be most effective to accomplish site goals and user needs. One of the design research tools we utilized for this project is the comparative assessment. The idea behind a comparative assessment is that people develop their expectations from the products and services that the key audience uses every day. In a comparative assessment, we look at products and services that customers are likely to encounter and use, although they may not necessarily be a client's direct competitors. Lastly, we utilized moodboards as a design research tool to collect relevant examples of user experiences that related to site goals. Above are a few samples we looked at during the design research phase to inform the architecture and UX. Online healthcare and patient engagement portals, how fitness apps encourage users to meet their goals, as well as how online courses guide the user through lessons and material were all sources of inspiration. In the early stages of building the UX and information architecture, these methodologies were used as benchmarking tools to model potential directions for the overall user experience that would be effective to employ in order to reach the site and user goals. 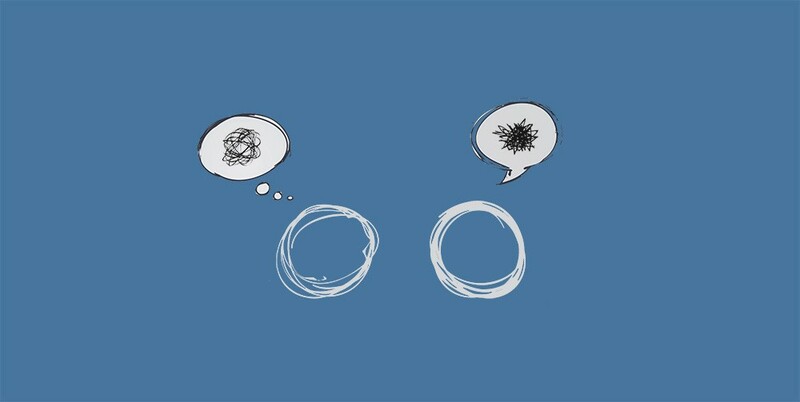 We often apply user states, motivations, needs, and scenarios to our proto-personas to begin to identify the touchpoints of the customer experience, and potential entry points to the solution we're building. Proto-personas are a modified version of personas that stimulate the same type of empathetic and user-oriented thinking, but with less investment in time. Basically, a user scenario puts a proto-personas in a situation that they would typically encounter while using whatever it is you are designing. 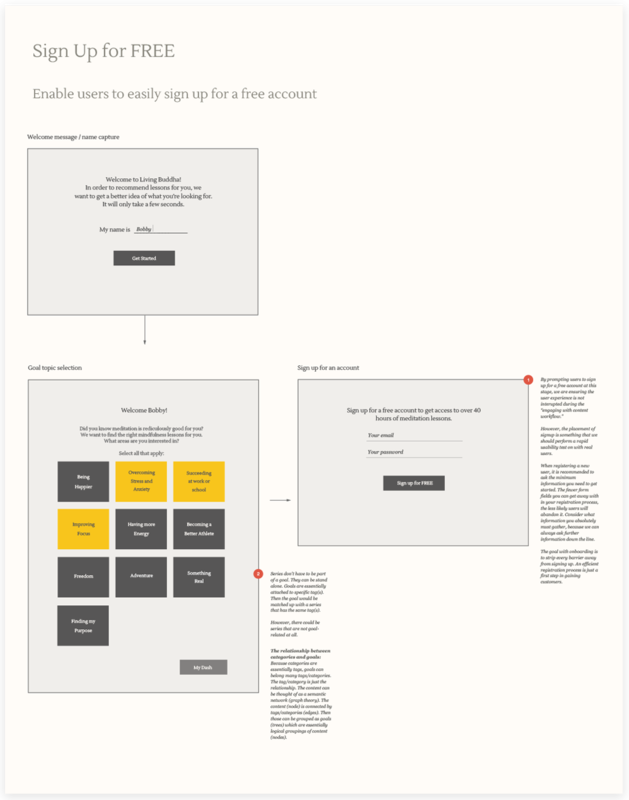 This is a simple design framework that helps us think through the essential steps in the customer experience and unveils opportunities for how the digital product can help address interactions and touchpoints. 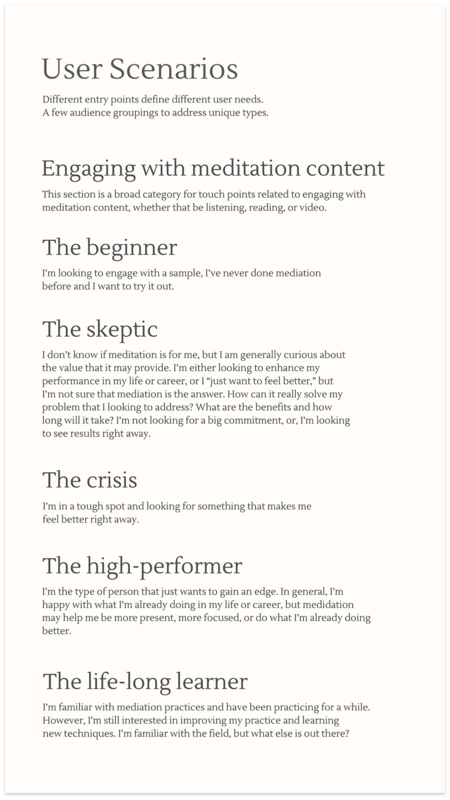 We identified various proto-personas that touched on specific user needs such as "I'm new to meditation, and I want to try it out" (the beginner), "I'm in a tough spot, I just want something that makes me feel better right away" (the crisis), and "I'm the type of person that just wants to gain an edge" (the high-performer). We use proto-personas to reference during the creation of user/ task flows and architecture, to orient our thinking and recommendations around user needs, as well as ensure we’re designing towards their specific pain points, motivations, and experience. Typically we’ll use proto-personas as a baseline for customer segments we need to focus on for usability testing and will adapt our personas based on testing and findings. For the purposes of this project, these proto-personas are more so intended to shift our thinking towards an empathic strategy, rather than catalog specific characteristics based on research. While initially, we anticipated that these user needs represented unique customer segments, we found that these needs instead represented various touchpoints in the customer's experience over time. Therefore, rather than treating these as distinct audiences, we used these needs as leverage points within the customer journey where Living Flow could provide value to the audience's needs. These proto-personas outline themes we heard during our meetings with the client, and highlight the motivation and needs segments we decided to focus on for the MVP. For example, lessons would be focused on "relieving stress and anxiety" or "enhancing focus." For example, lessons focused on being tailored for "beginners" or "practitioners." After exploring both avenues and how this would influence the architecture and user experience, we determined that topic-based content would be more effective because users would be more likely to select topics that they were interested in, versus identifying with a certain audience. This assumption was validated through our user testing sessions. Additionally, the client's source content was more tailored towards individual topics, rather than a specific audience. We identified two primary workflows that were key to the product's success: 1) onboarding, and 2) engaging with content. We utilized paper prototyping to create and test user interfaces quickly and cheaply. 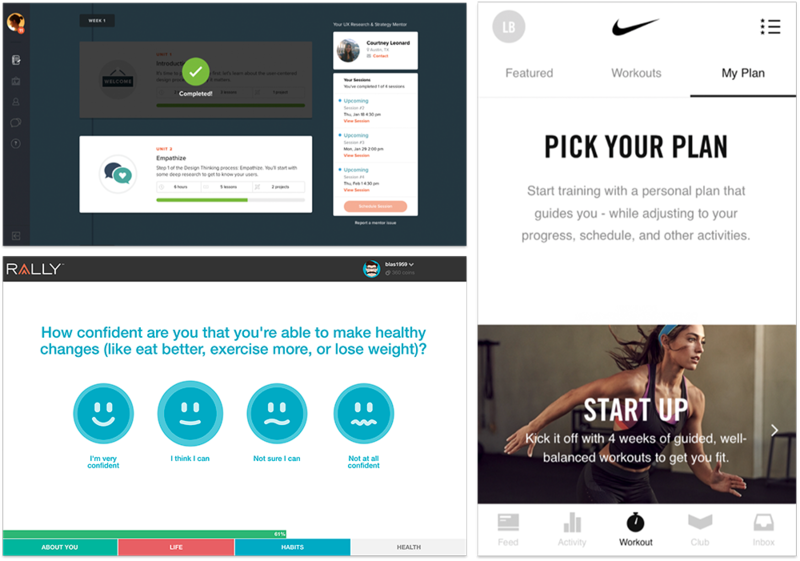 For user testing, we selected 1-2 key moments to prototype. One of the moments that was critical to prototype was the onboarding experience. 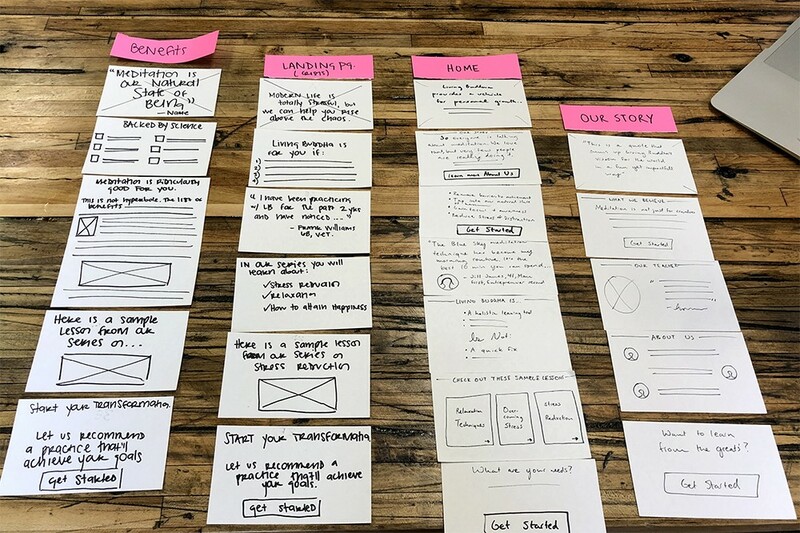 Because the onboarding experience was a key component to guide users to content that would meet their unique needs, we first tested the interfaces through paper prototypes with our internal team, both with index cards, and then uploading the screens to Invision. This enabled us to refine and vet the key interactions for a digital prototype we tested with external user testing participants during a set of in-person moderated user testing sessions. Though this project did not include a budget for user testing, we were able to conduct a three one-hour session with participants that aligned with our target market to unveil gaps and opportunities with the UX. There were key themes that resulted from the sessions, which helped fine-tune the design principles and content strategy we used moving forward, such as the importance of conveying Living Flow's legitimacy as a brand, aligning with user's values, and "cutting through the fluff." 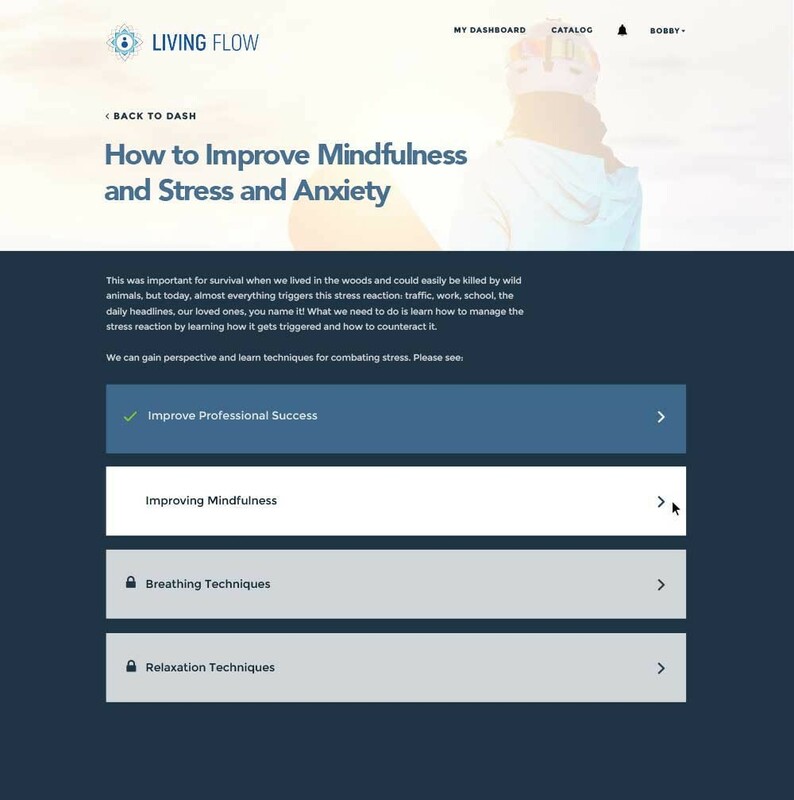 Building off of our user testing findings and research, the user experience we designed aimed to offer users more depth in their meditation and mindfulness practice, while helping them achieve their personal and professional goals. Keeping the wireframes medium fidelity helped us iterate though various soultions quickly, and strip out any unessessary steps that would create friction in the user experience. Once we had the basic framework modeled for the onboarding and course experience, our design and dev teams worked together to document the functionality that would support the best user experience. These documents were our roadmap for both the design and development phase. We designed a photo-centric brand experience focused on "emerging adults" in both high-performance contexts and natural environments, to achieve a contemporary spin on the desired end-state of a higher state-of-mind. We kept the brand language simple with bright colors, custom iconography, and a strong photo strategy. From the user's dashboard or catalog, users can dive into the individual lessons and series to read and watch videos on topics that relate to their goals. 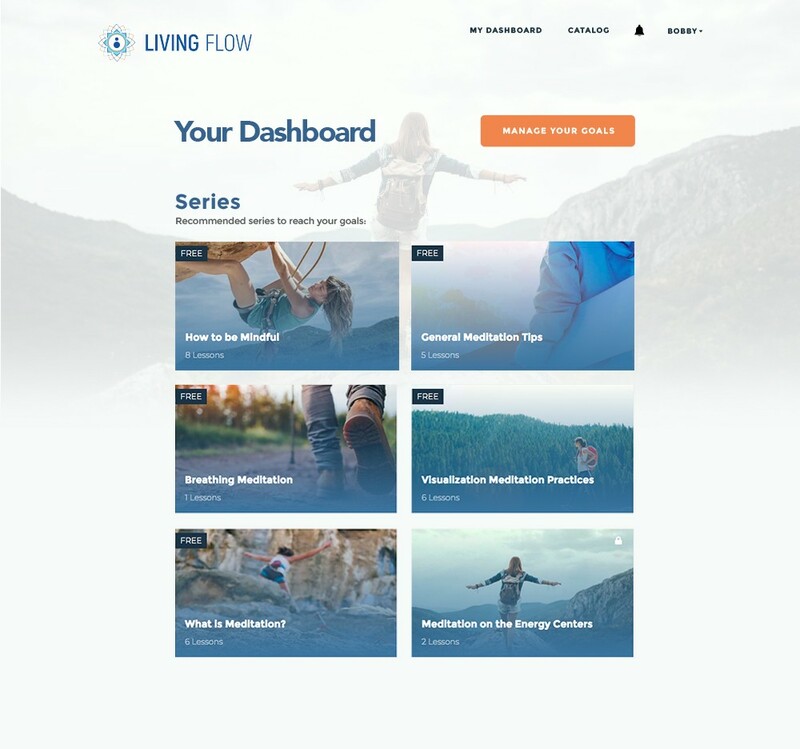 With a new brand and digital product that provides free and subscription-based content, Living Flow is able to deliver resources to people grappling with life’s most difficult questions and seeking self-improvement techniques. 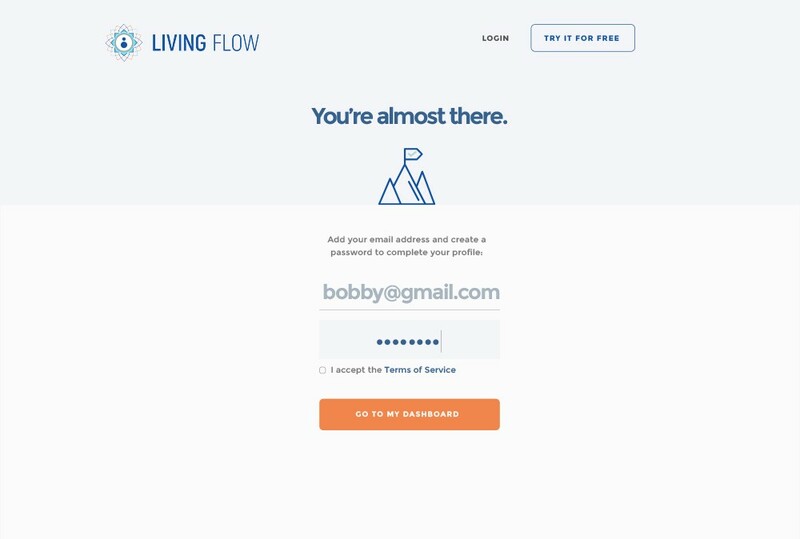 Living Flow enables users to sign up for an account and have access to hundreds of mindfulness and meditation lessons at their fingertips.